Due to the rapid development ofteclmology and transportations, the number of international students pursuing tertimy education in developed counh'ies is increasing dramatically. These intemational students move ji·om different countries to developed countries, such as America, Australia, Canada and the United Kingdom. 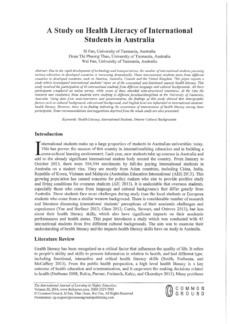 This paper reports a study wllich investigated intemational students' views on of the conceptual and fimctional aspects health literacy. This study involved the participation of 45 international students fi'om different language and cultural backgrounds. All these participants completed an online survey, while seven of them a/tended semi-structured interviews. At the time the research was conductecl, these students were studying in different faculties/disciplines at the University of Tasmania, Australia. Using data ji·om semi-interviews and questionnaires, the findings of this study showed that demographic factors such as cultural background, educational background, and English level are influential to intemational students' health literacy. However, there is no finding indicating the occurrence of unawareness of health literacy among these participants. Some recommendations and suggestions deprived fi'om the whole study are also presented.